Imagine your guests sipping cocktails at the edge of the waterfront as they look out on the city skyline; then enjoying a gourmet dinner as dinosaurs loom overhead; and finally, mingling with the stars as they enjoy the stunning view from the rooftop Observatory. 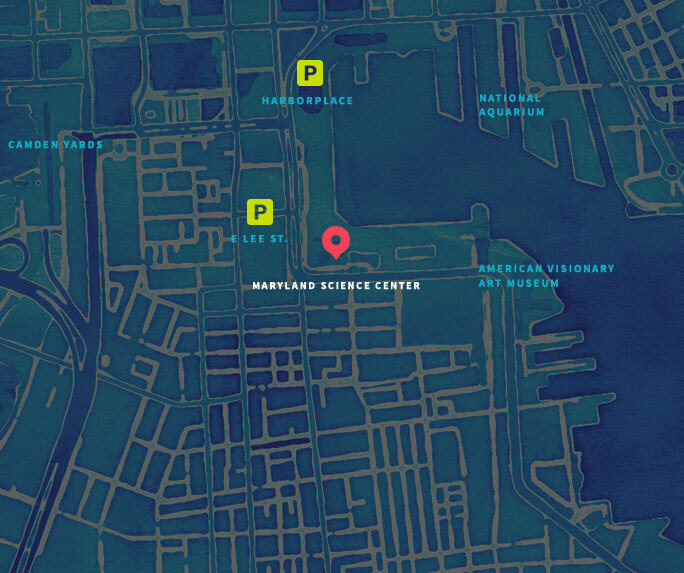 The Maryland Science Center transforms ordinary events into extraordinary experiences. Whether you are planning a business retreat for 10 or a black-tie gala for 1000, you are sure to find a truly unique atmosphere in our more than 100,000 square feet of event space. Our talented staff will work with you, every step of the way, to ensure an unforgettable experience. From catering to centerpieces and entertainment, to your entrance, we will help make certain every detail is perfect. Maryland Science Center provides a unique venue that can be customized for any occasion, with breathtaking views of Baltimore’s skyline and famed Inner Harbor. Engage your guests with a private screening in the IMAX Theater, presentations in our planetarium and activities within our hundreds of hands-on exhibits. From sophisticated splendor to casual fun, the possibilities are endless – the only limitation is your imagination! Call Meghan Jillson at 410.779.1624 or e-mail at mjillson@marylandsciencecenter.org to create your next extraordinary event. Maryland Science Center, your “not so traditional” wedding venue is an ideal place to host your most special day. With breathtaking views of downtown, the Harbor Terrace is a spectacular rooftop space your family and friends will be talking about for years to come. Our indoor spaces with stunning views of the harbor, are a perfect compliment to the day you’ve always been dreaming about. Inquire with us today about hosting your wedding at Maryland Science Center. Call Meghan Jillson our Event Sales Manager at 410.779.1624 or email mjillson@marylandsciencecenter.org.